Retreat from the cares of the world in this tastefully furnished, one-bedroom, one-bath, oceanfront home. Punana Aloha, which means 'Love Nest' in Hawaiian, is a one-bedroom, one-bath hideaway on incomparable Anini Beach. Constructed of natural cedar throughout and boasting a wood-burning fireplace, the cottage is the perfect choice for a vacation to simply 'get away from it all.' Restricted to a maximum of two guests, the cottage is ideal for honeymoons or anniversaries. Located on Kauai's verdant North Shore, Anini Beach is a haven for the traveler who wants to experience the unspoiled natural beauty of Hawaii. Protected by a large outer reef, the quiet waters of Anini are perfect for swimming, snorkeling, fishing, kayaking, windsurfing, and sunning. 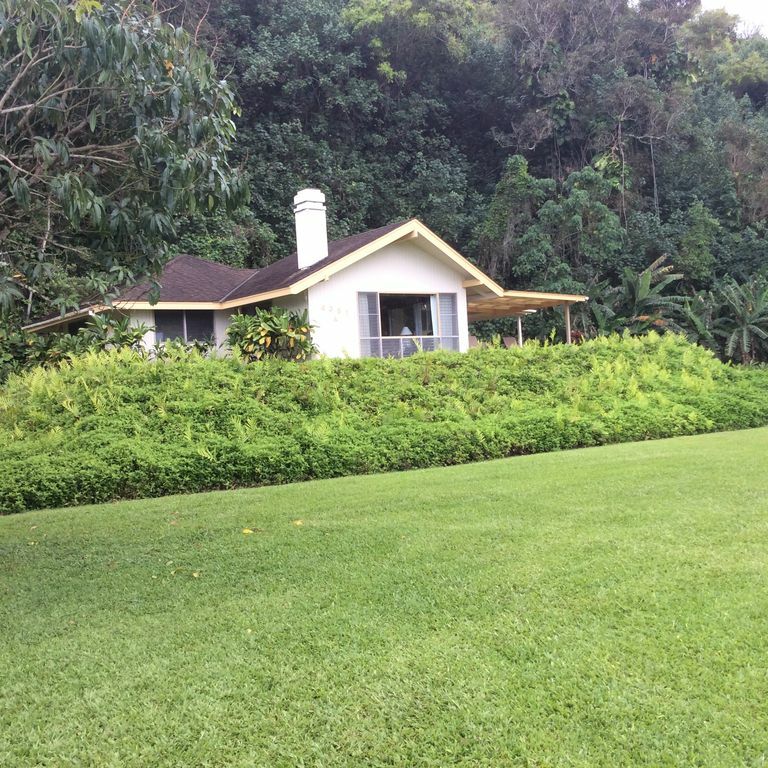 Follow Anini Road almost to the spot where it dead ends at Anini Stream and you will find Punana Aloha on a beautifully landscaped half acre of land fronting the ocean. The ocean view is unobstructed, and your toes will touch the sand of the beach less than 75 yards from the front door. Features include 896 square feet of living area with two covered lanais, two reclining chairs in living room, built-in desk/office area, daybed, comfortable king-sized bed in bedroom, full bathroom with tub/shower, ceiling fans, washer and dryer, telephones, large charcoal barbeque/smoker, chaise lounges, and beach chairs. The fully-equipped kitchen contains solid oak cabinets with a large pantry, a four-burner gas range with oven, 20' refrigerator with ice maker, dishwasher, garbage disposal, microwave, six-foot bar/serving counter/cooking island, coffee maker, rice cooker/steamer, toaster, blender, mixer, etc. The living room has a home entertainment center which includes a 27-inch color cable TV and a VCR/DVD player. We provide FREE HIGH SPEED INTERNET ACCESS (DSL), FREE UNLIMITED LONG DISTANCE CALLING (within the USA), CALLER ID, 3 WAY CALLING, AND *69 (enabling you to dial the last number who called you). There is a cordless phone in the kitchen area, and one more in the bedroom. The kitchen phone also has an answering machine. Punana Aloha is fully permitted as a transient vacation rental by the County of Kauai. Our Non Conforming Use Certificate number is 5082. In the North Shore's idyllic setting you can: swim, surf; sunbathe, scuba dive or snorkel, wind surf (with rental boards and lessons available at Anini Beach Park), go shore fishing, book a deep water charter; beach comb, go horseback riding at nearby stables, hike the island's awesome trails, enjoy gourmet dining, whale watch, take a Na Pali Coast boat tour or a sunset sailing cruise in Hanalei Bay, book a helicopter tour of fabulous Waimea Canyon, play tennis, enjoy worldclass golfing, drive around the island and take in the sights, or just simply lie back and bask in the simple glory of being in one of earth's most naturally beautiful and peaceful places. We will be happy to help with recommendations in your activity planning. Just let us know what you would like to do! Punana Aloha's location almost at the dead end of Anini Road (1/5 mile from where the paved road ends and the sand and gravel road begins), where there is only a single row of homes along the beach, means that our guests enjoy quiet and privacy not found along most of the rest of Anini . The protecting reef (one of the largest in Hawaii) assures that the waves break far out and not on the shore, and the calm shoreline and shallow waters make the area in front of the house ideal for swimming and snorkeling most of the year (except during periods of high winter surf). Wonderful property and location. Couldn’t have been better! Perfect couples getaway on Kauai. We’ll be back! This house met and exceeded our expectations in all regards. Well furnished including everything needed to be self sufficient. Excellent ocean view, listen to the waves crashing while you sleep. Very short walk up the driveway to fantastic and sandy Anini Beach. My wife and I were seeking a remote location on Kauai where we could relax and enjoy a respite from the northeast US winter. We chose a winner with this rental. Located at the end of a dead-end road on beautiful and underutilized Anini Beach, this cottage and the owner,Suzi Nakea, provided us with almost everything we needed for a nearly perfect vacation. We had complete privacy, and felt as if we owned the beach, since so few others ventured beyond the underutilized public beach area, about a half mile away. The cottage rental included all the amenities we needed (e.g., washer/dryer, full kitchen, comfortable bed, beach chairs), had an unobstructed view of the ocean and the beach's protective reef, and was only about 75 yards from the sand. Unlike many of Hawaii's beaches, Anini is completely protected by the aforementioned reef, thereby providing gentle surf for swimming and snorkeling. We rented snorkeling equipment in Hanalei (a short drive away) and saw beautiful tropical fish and an entire sea turtle family (we found the best snorkeling to be at the public beach, but enjoyed snorkeling in front of our cottage, as well). Suzi Nakea was a cordial hostess and a good communicator - although we never interacted with her in person, she was always available in nearby Princeville if a problem arose, and we greatly appreciated the privacy she gave us. If one had to identify a downside to this rental, it might be the poor condition of Anini Road in the vicinity of the cottage. But after a couple of trips to town, we became accustomed to driving it very slowly, and we came to appreciate the fact that the condition of the road kept many potential visitors away from our end of the beach and thus was an asset. We tend to visit different locales for our winter getaways, but if we return to Hawaii in the future, we would choose to spend the entire time on Kauai, and we would head for Anini Beach and Suzi's cottage once again! We enjoyed the view of the ocean. The Cottage was entirely too dated, too damp, and there were spiders and wasps constantly making their way in. The cottage is always in the shade, so it will forever be moist with the rain on the North shore. Bathroom rusty in areas, dated tub/sink, closet doors come off runners, your clothes will be damp the entire stay if you go during the rainy season. Go further south and look for something more renovated. Hi Adrienne, thank you for your feedback. I am sorry this home was not a good fit for you, I only wish you had contacted me while you were here so I could try to make your stay more comfortable. We are local, on island owners, and take your comfort very seriously. For our future guests, I would like to be clear that this is not a new home, and yes, the bathroom is a bit dated. However, it is clean and well equipped and hopefully the one place you will spend the least time in. We will likely do a little updating in the bathroom when we feel it is necessary, although that will probably result in a rate increase. At this time, it is not a priority. Prior to this review, we have had a solid 5 star rating so please take that into consideration. This is a beach home in the tropics and a paradise for nature lovers who want to be off the beaten path, away from the crowds and surrounded by Kauai's natural beauty. If your taste is a crowded, bug free, sterile environment, this will not likely be a good fit for you. Please feel free to email any questions you may have prior to moving forward with a reservation request. Loved this cottage. Will be back. Paradise!! I visited Anini Beach once ten years ago and always told myself I would rent one of the houses someday and return - and I did! I love this place and how it feels a bit remote even though you are minutes from Princeville and Hanalei. The owners Suzi and Bob couldn't have been nicer or more easy to deal with. What a peaceful vacation!